Stamp set found on page 67 of the NEW 2016-17 annual catalog. See all images in this set below. 1. 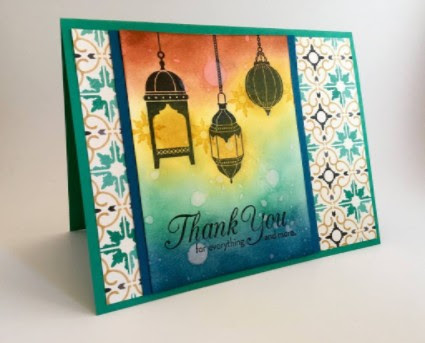 Stamp Lanterns and Thank You in Black archival ink on Very Vanilla card stock and allow to dry. 2. Sponge Crushed Curry ink starting inside lanterns (darkest) out across the card stock (lighter as it moves away from the lanterns) using sponge daubers. 4. Start at the bottom edge of the card stock sponging Dapper Denim ink and getting lighter as you move up the card. Leave room for the Emerald Envy and blend from the Denim side (darkest) into the Curry above (lighter). 5. Splatter water from your aqua painter onto the ombre background. Allow to sit for 15-25 seconds and blot excess water off. Let it dry. 6. Stamp star around lanterns with Crushed Curry ink. 7. Layer and assemble card as shown. 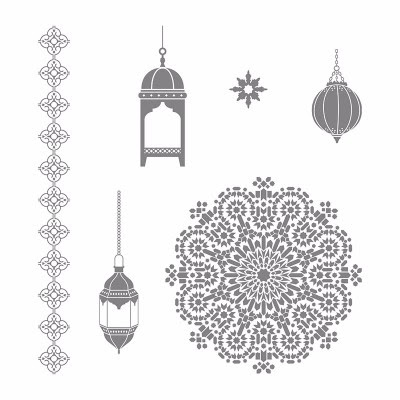 Here are all the images from the Moroccan Nights set.....cute huh?